The Kansas City Royals visit Rogers Centre on Thursday, September 21, 2017 to play the Toronto Blue Jays. The probable starters are Jason Vargas for the Royals and J.A. Happ for the Blue Jays. The opening line for this matchup has Kansas City at +154 and Toronto at -164. The Royals have a 70-74-6 over/under record and a 71-79-0 run line mark. The Blue Jays are 70-81-0 against the run line and have a 66-78-7 over/under record. The Royals have a 73-77 overall record this season. Starting pitcher Jason Vargas has a 16-10 record with an earned run average of 4.19 and a WHIP of 1.34. He has 120 strikeouts over his 163.1 innings pitched and he's given up 168 hits. He allows 9.3 hits per 9 innings and he has a FIP of 4.69. The bullpen has an earned run average of 4.32 and they have given up 516 base hits on the year. Teams are hitting .252 against the bullpen and they've struck out 468 hitters and walked 228 batters. As a team, Kansas City allows 9.3 hits per nine innings while striking out 7.6 batters per nine innings. They are 20th in the league in team earned run average at 4.61. The Royals pitchers collectively have given up 1,375 base hits and 683 earned runs. They have allowed 183 home runs this season, ranking them 14th in the league. Kansas City as a pitching staff has walked 478 batters and struck out 1,125. They have walked 3.2 men per 9 innings while striking out 7.6 per 9. They have a team WHIP of 1.39 and their FIP as a unit is 4.44. As a team Kansas City is hitting .259, good for 12th in the league. The Royals hold a .420 team slugging percentage and an on-base percentage of .311, which is good for 28th in baseball. They rank 12th in MLB with 8.9 hits per game. Eric Hosmer is hitting .323 with an on-base percentage of .390. He has 182 hits this season in 563 at bats with 87 runs batted in. He has a slugging percentage of .506 and an OPS+ of 135. Lorenzo Cain is hitting .300 this year and he has an on-base percentage of .363. He has totaled 164 hits and he has driven in 48 men in 546 at bats. His OPS+ is 113 while his slugging percentage is at .443. 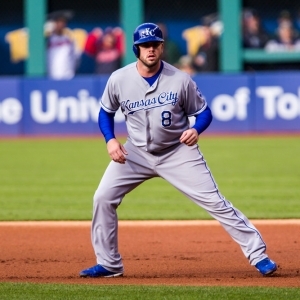 The Royals have 1,331 base hits, including 238 doubles and 180 homers. Kansas City has walked 361 times so far this year and they have struck out 1,084 times as a team. They have left 938 runners on base and have a team OPS of .731. They tally 4.33 runs per contest and have totaled 650 runs this year. Toronto has a 71-80 overall mark this year. With an earned run average of 3.76, J.A. Happ has a 9-10 record and a 1.35 WHIP. He has 127 strikeouts over the 131.2 innings he's pitched. He's also given up 134 hits. He allows 9.2 hits per nine innings and his FIP stands at 4.01. The bullpen has an earned run average of 4.22 and they have given up 505 base hits on the year. Teams are hitting .238 against the Blue Jays bullpen. Their relievers have struck out 588 batters and walked 202 opposing hitters. As a team, Toronto allows 9 hits per nine innings while striking out 8.5 batters per nine innings. They are 14th in the league in team earned run average at 4.4. The Blue Jays pitchers as a team have surrendered 1,367 base knocks and 669 earned runs this season. They have given up 188 home runs this year, which ranks 13th in Major League Baseball. Toronto as a staff has walked 518 hitters and struck out 1,286 batters. They give up a walk 3.4 times per 9 innings while they strike out 8.5 per 9. Their team WHIP is 1.38 while their FIP as a staff is 4.30. As a team, they are batting .242, good for 29th in the league. The Blue Jays hold a .413 team slugging percentage and an on-base percentage of .314, which is good for 26th in baseball. They rank 27th in MLB with 8.2 hits per contest. Kevin Pillar comes into this matchup batting .258 with an OBP of .304. He has 144 hits this year along with 42 RBI in 558 AB's. He maintains a slugging percentage of .412 with an OPS+ of 85. Justin Smoak is hitting .278 this season and he has an OBP of .360. He has collected 146 hits in 526 at bats while driving in 89 runs. He has an OPS+ of 133 and a slugging percentage of .549. The Blue Jays as a unit have 1,244 base hits, including 254 doubles and 206 homers. Toronto has walked 512 times this year and they have struck out on 1,221 occasions. They have had 1,012 men left on base and have an OPS of .727. They have scored 4.27 runs per game and totaled 645 runs this season.